Fulvic Blend: Arguably the most valuable input in biological agriculture. What is AG30 Fulvic Blend (FB)? – A unique combination of patented anionic polymer and high quality fulvic acid. 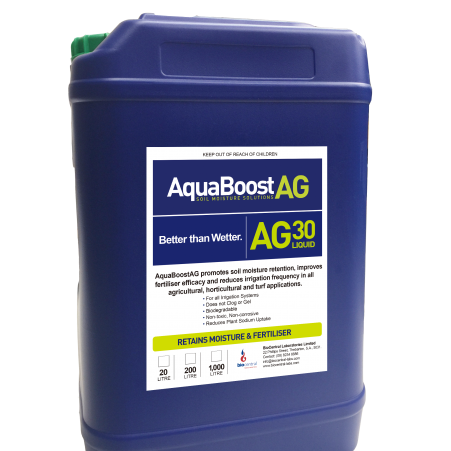 The polymers in AG30 FB are proven to improve water penetration and lateral spread in soils and are a food source for soil biology. – Fulvic Acid is the element found in humus, the highly nutritious layer of the earth. Partially de-composed matter is the basis of humus and peat. It is this highly nutritious layer that feeds plants and ensures that they grow strong and healthy. 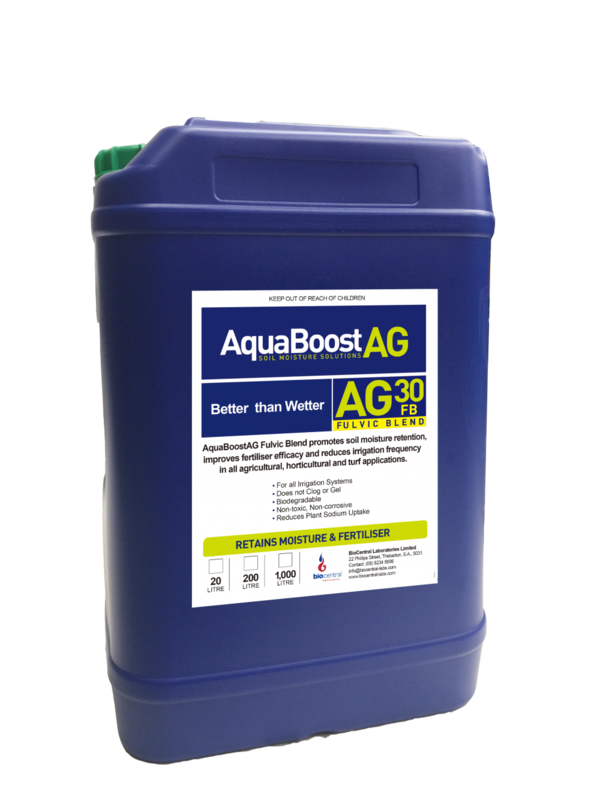 How does AquaBoostAG30 FB assist? – Beneficial microorganisms in agricultural soils are constantly under attack by the toxic residues from herbicides, pesticides, fungicides and the heavy metals from acid treated fertilisers. – Fulvic acids stimulate plants bio chemical and physiological processes to improve growth and development by penetrating the root and leaf cuticle through fertigation and foliar sprays, respectively. Fulvic acid also stimulates plants auxin production and enhances other growth hormones. What if I have limited microbial activity? 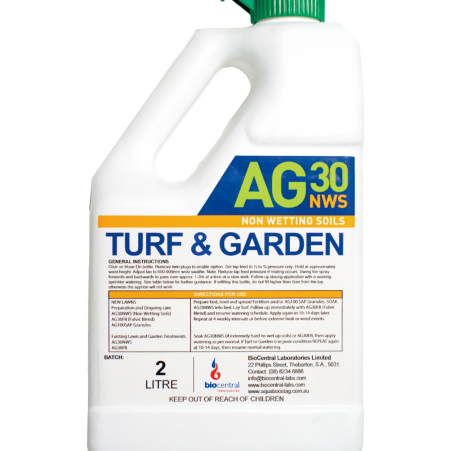 – Fulvic acid is a microbial promotant and teamed with the linear polymer can increase beneficial soil biology. Iron, a poorly transported mineral, is dissolved, complexed and transported into the plant more efficiently. – Potassium present in large reserves in insoluble form are solubilised and released in the presence of fulvic acid. Silica is also solubilised by fulvic acid and water soluble silica performs a role similar to calcium, strengthening cell walls and building brix levels. 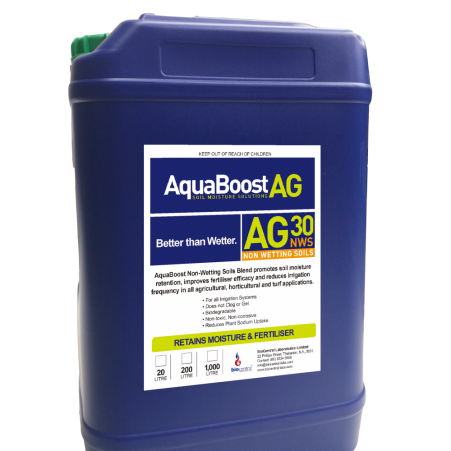 – AG30 FB improves brix and drought resistance, root cell division, plant oxygen intake and metabolic processes. AG30 FB Restores plant Health after heat related stress and improves uptake of moisture and nutrients.